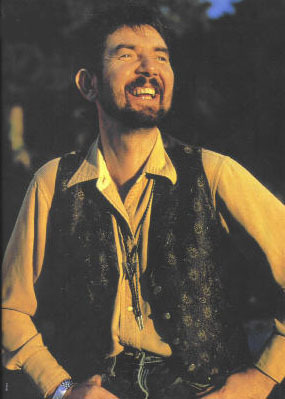 This post is published to celebrate what would have been Ronnie Lane's 70th birthday - on 1 April. 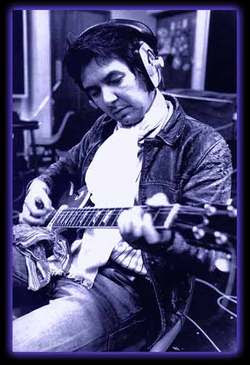 Forest Gate youngster, Ronnie Lane's life (1 April 1946 - 4 June 1997) was perhaps best summed up by one of his greatest hits, penned with Steve Marriott: All or Nothing. Ronnie was a key figure in two of Britain's most influential bands in the 1960's and 70's (The Small Faces and The Faces), yet died in poverty and obscurity aged only 51 in a remote town in the American Rockies. This is his story. Ronnie was the son of a Forest Gate lorry driver, Stan, and his wife Elsie, and spent his childhood at 385 Romford Road - see photo. Stan was the main influence on his early life and took responsibility for raising Ronnie and his older brother, Stan junior, as his mother began to suffer from the same debilitating disease - Multiple Sclerosis - that was to end Ronnie's life, prematurely. Brother Stan referred to their mum as a "cold fish", and Ronnie always spoke of his dad in revered terms, barely mentioning his mother, in later years. Encouraged by his dad, Ronnie picked up a guitar for the first time aged 14. Soon after he left school (which he detested) he signed up to an art course at what was later to become Lister school. He subsequently drifted around a series of mundane jobs (electrician's mate, pipefitter's mate, scooter messenger, fairground worker etc) until he got his first musical break, as a guitar tester for Selmer's. 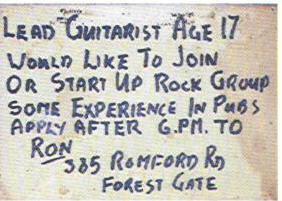 He soon got the music bug and was quickly putting up adverts in local shop windows (see photo of an example)looking to recruit band members. This lead to the foundation of his first band, The Outcasts, with local drummer Kenny (later Kenney, of Who fame) Jones. 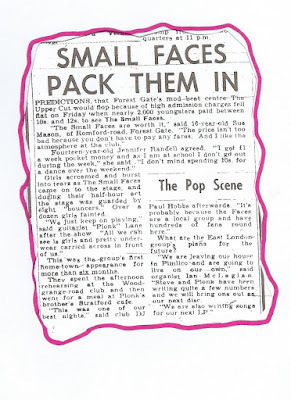 The band quickly fell apart, however, but the pair of them teamed up with fellow local boy Steve Marriott (brought up at 26 Strone Road, Manor Park, opposite the Ruskin Arms), and Jimmy Winston on keyboards. Ronnie switched from playing lead guitar, to bass and Marriott gave him the nickname, Plonk, as a result. The four of them were snapped up by Don Arden, the notoriously aggressive manager, who promoted them as a band to appeal to Mods. Ronnie was a friend of Kenny Johnson, who later went on to run the Lotus Club on Woodgrange Road. Kenny had the band playing at the club a few times and arranged for them to rehearse in his brother, Eddie's, Stratford pub, The Two Puddings. See here. The Small Faces, as they were to be called - they were all under 5' 5" tall - had their first hit: Whatcha Gonna Do About It - in October 1965. They were widely seen as being cheap imitations of The Who, at first. They rapidly ditched Jimmy Winston and replaced him with a Ronnie Lane -look-alike, Ian McLagan, on keyboards. The Marriott/Lane song writing duo penned a dozen hits for the band over the next three years, including All or Nothing, a number 1 in September 1966. 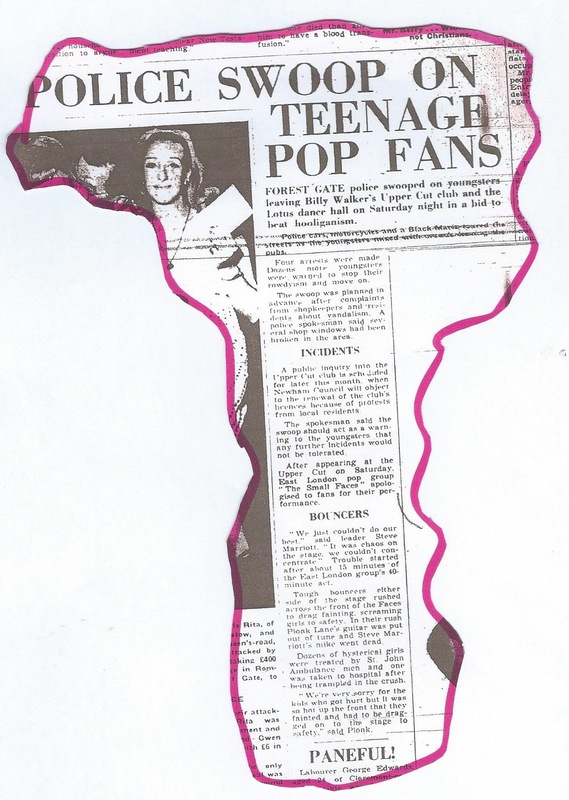 They played twice at Billy Walker's Upper Cut Club, on Woodgrange Road (see below for the adverts and the Stratford Express report). 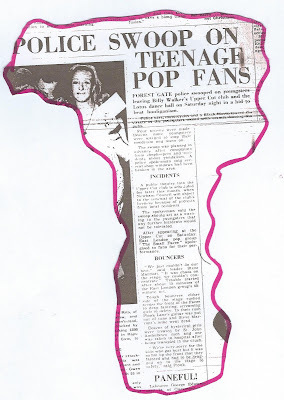 The controversial Arden had the band on wages, without passing on the royalties for their songs, claiming that they were " too high on alcohol and drugs the whole time" to be able to handle more money. The band eventually disentangled themselves from his clutches, and from the Decca label they recorded on. They then teamed up with Andrew Loog Oldham - then manager of the Rolling Stones - and signed up to a new record label, Immediate, that he launched in 1967. A stream of hits followed, including Itchycoo Park. 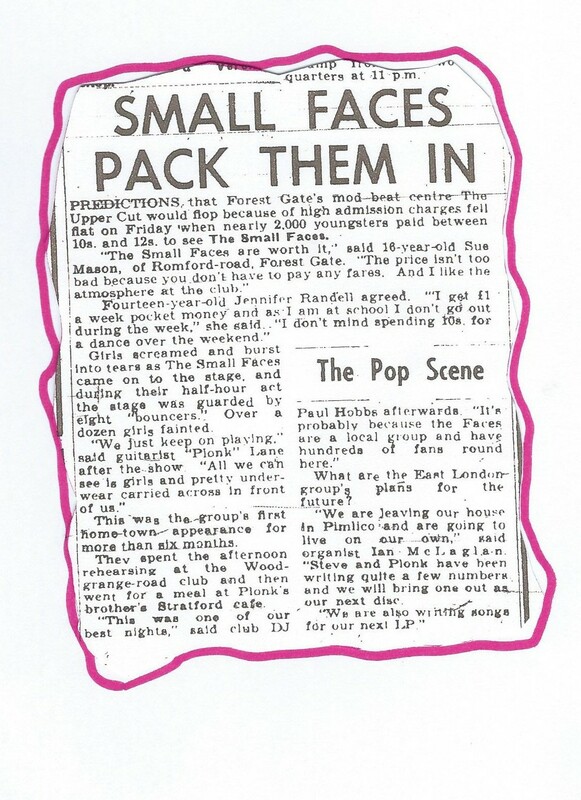 The location of the park has been one of pop music's long running obsessions, but in the autumn of 1967, Ronnie called it "A place we used to go to in Ilford years ago (a bombsite, next to a railway line, according to Kenny Jones). Some bloke we know suggested it to us because it was full of nettles and you keep scratching". Other successes followed, like Lazy Sunday Afternoon and the seminal Ogden's Nut Gone Flake album, which topped the charts for six weeks. 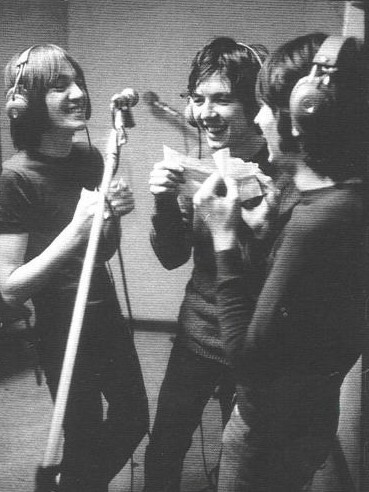 Then - the almost inevitable, for the time: members of the band turned to LSD and Indian mysticism and tensions mounted over "musical differences"; Marriott left and went on to form Humble Pie; the Immediate label went broke - and it took over two decades for the band members to get their royalties from the remnants of the company. Rod Stewart and Ronnie Wood, both formerly of the Jeff Beck Group joined the rump of the Small Faces, and because these new pair weren't particularly short, the "Small" in the band's name was dropped - to become The Faces. Stewart was to prove to be another Marriott, as far as Lane was concerned - more interested in going his own way. He soon had huge hits with Maggie May and the Every Picture Tells a Story album, as a solo performer; so Ronnie dropped out of The Faces, in protest, in 1973. It was to be largely downhill, in music, health and money terms for Ronnie Lane from now. He had an unsuccessful spell at running a sheep farm in Fishpool, in Wales - he was no farmer. He put together another band, perhaps by way of prediction, known as Slim Chance, which had a spectacularly badly managed and financially disastrous tour, and bankrupted Ronnie. By this time, his health was starting to deteriorate. At first he put the clumsiness he was developing down to the long-term effects of drink and drug abuse. Slowly the realisation dawned, however, he was struck by the same debilitating MS that was to kill his mother. Around this time he developed close friendships with both Eric Clapton and Pete Townsend (of The Who), both of whom were later to help him financially, in trying to treat his disease. 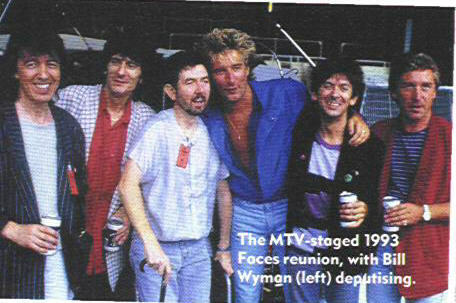 Ronnie went to Florida in the early 80's and in desperation began experimenting with some quack remedies to address his MS.
His musical allies (Pete Townsend, Eric Clapton, Jeff Beck, Steve Winwood, Kenney Jones, Bill Wyman, Charlie Watts, Andy Fairweather-Low etc) rallied and helped support his charity ARMS (Action Research into Multiple Sclerosis) and raised over $1m. in benefit concerts for the cause. A branch of the charity was set up in the USA, but 90% of the proceeds were frittered away in "administrative costs", with long-standing litigious repercussions. Ronnie relocated to Austin, Texas in 1987, where he met his third wife, Susan Gallegos, of Hispanic/North American heritage (her father had been an Apache chief). As his condition deteriorated, he began to withdraw socially. In 1994 the couple moved to the relatively remote settlement of Trinidad in the Colorado Rockies (pop 5,000). By now Rod Stewart and Ronnie Wood were beginning to take care of his medical bills, and royalties from the music he had created over two decades earlier began to trickle in. His mobility and speech rapidly deteriorated and he died of the same disease that killed his mother, in 1997. 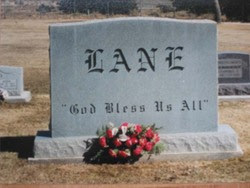 He was buried in a private ceremony, just hours afterwards. 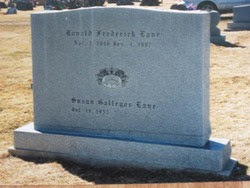 The inscription on his grave indicates that in his later years he turned his back on his rock 'n roll hell-raising, and in his final interviews denounced the use and effects of alcohol and drug abuse. His memory lives on, but not just through his music. In a rare moment of wry humour, Newham Council recognised him around the turn of what would have been his 55th birthday by naming a road after him in Manor Park (see photo). 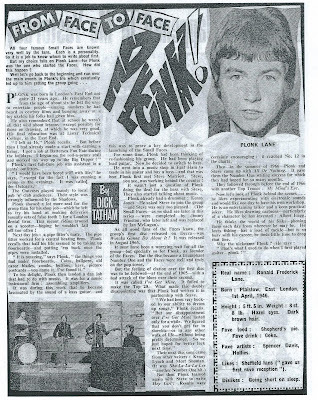 Newham's tribute: Ronnie Lane, Manor Park. location is one of the shortest streets in the borough? He was inducted into the Rock and Roll Hall of Fame in 2012. A tribute to the Small Faces, All or Nothing, has recently been put together by former East End Actress, Carol Harrison, and it runs at the Vaults Theatre, Waterloo until 30 April this year. 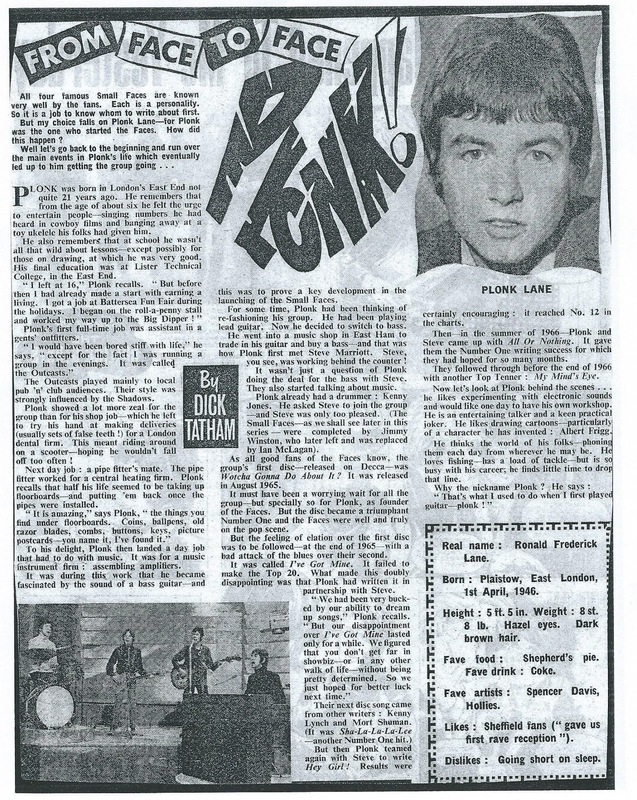 Footnote: We are indebted to Mojo Magazine for an article authored by Wayne Penne on Ronnie Lane, in September 1997 for much of the material and insight in the above post. This post is a summary of the regeneration plans currently out for consultation concerning 39a - 49a Woodgrange Road (between Gregg's and Barry's) - see map and photo for location, and updated as plans come to fruition. It has been updated following planning committee discussions in March and May 2017. The committee finally approved the proposals at the second meeting. Scroll down for the details. It was updated in October 2018, as demolition work seemed imminent. In the apparent absence of any other on-line "community forum", this blog can be used as a medium for people to share views on the proposals. For full details of how this could work, see the footnote at the end of this article. London Iron Works (LWI) is a medium sized east London-based firm of developers who have worked up proposals for the redevelopment of this small stretch of Woodgrange Road. They have nothing to do with the much larger and controversial plans put forward and then abandoned by Obsidian four years ago. 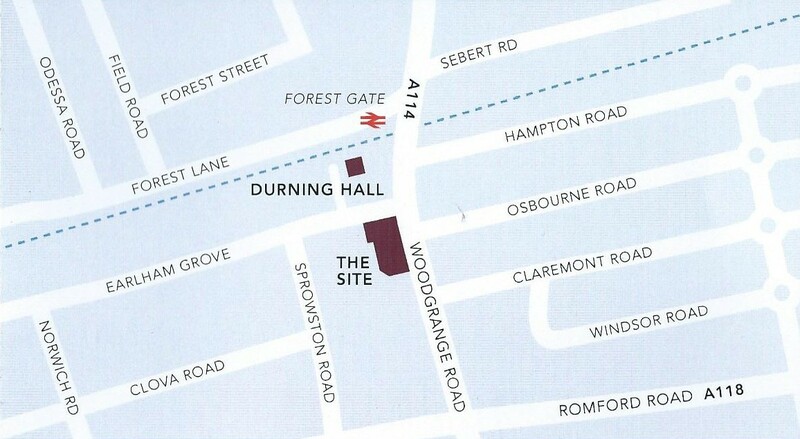 LWI held two consultation evenings on 21 and 22 March at Durning Hall. We attended, as did many others. Helpful staff from the developers were on hand to answer questions, and as far as we could discern, they were very open and honest about the challenges and opportunities the proposals present. Below is a short summary of what we discovered and felt worth sharing with others who were, perhaps, not able to attend. We have no vested interest, whatsoever, in the outcome of the consultation, although, for the record, were impressed by the proposals. Let that, however, not inhibit those with alternative views from sharing their thoughts, below. There are currently 12 retail units affected by the proposal. They, and the accommodation behind, would be demolished. The accommodation is largely officially vacant, although it is believed there are a number of squatters in situ. The proposal would be to "revitalise" the shops. There would be no guarantee of tenure for the existing shops in the new development, and in any case they would have to close or move for at least 12 - 15 months around the rebuilding period (see anticipated timescale, below). Rents in the new shops will be considerably higher than those currently paid by the present occupiers. This is likely to be a significant issue for Barry's, the butcher, for example. The proposal is to construct around 60 residential units. The exact mix will be subject to negotiation between developer and the council. It would, for example, be in the financial interests of the developer to only build one-bedroom flats for sale. The council, however, will wish to see some larger properties (2 and 3 bedrooms) to ensure a good demographic balance of families, singles etc in the development and also to guarantee that there is an appropriate mix of social and owner-occupied properties. The developers accept this, and negotiations between council and developers will determine the final outcome mixture. All, or almost all, units will have balconies, most of which will be south facing. There will be some recreational space (roof gardens etc) in the development and provision for cycle parking. There could be some consequential modifications to the local road lay-out and this will doubtless feature in the mix of negotiations between the developer and the council. As mentioned above, London Iron Works, the developers are an east-end firm specialising in medium size developments, like this one, that aim to fit in with local community needs and are empathetic to the local architecture (so no 19 storey building proposals, here). 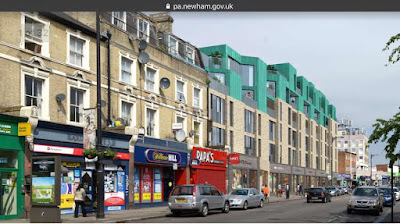 They are working with Newham council on other developments in Manor Park - near the railway station and in East Ham, in what was the old Co-op site (the car park next to the Denmark Arms). Although they aim to be empathetic with Victorian architecture, they are building in and for the 21st century, so will not seek to replicate 1880s buildings. In trying to be sympathetic, they will pay due regard to the local skyline, and brick work, for example. Little is known about what is likely to happen to the former "Obsidian lands", although it is inconceivable, with the imminence of Crossrail, there will not be significant development proposals coming along soon. It does seem likely that there will be a development, built around the same time as this Woodgrange Road one, a little behind it in Earlham Grove. It will be in the land boarded by blue hoardings, between Barry's and the Community Garden. We understand that London Iron Works was interested in developing this too, but found negotiations around acquisition and planning extremely difficult. Instead, it would appear that the Council-back and owned Red Doors company is likely to do the construction and Swan Housing, who effectively run the council's outsourced housing management function, will operate the development. We idly ask whether these council "insiders" found negotiating life for the plot as difficult as London Iron Works seemed to. You may smell a rat, we couldn't possibly comment. 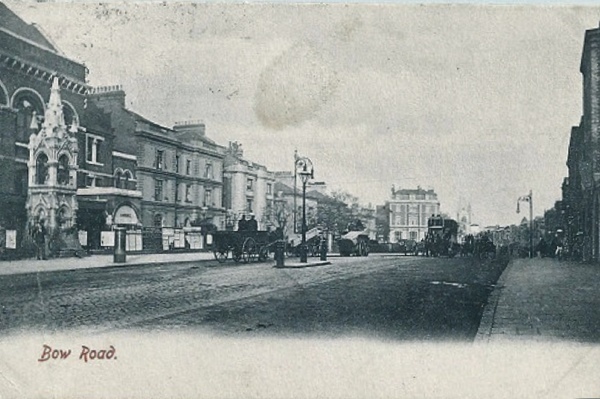 It is interesting, however, that although this Earlham Grove development is being advanced by those with great insight into the local authority, its ways and, presumably the local community, they have not found it desirable or necessary to seek the views of the affected public on their proposals, as London Iron Works has. If you would like to comment to London Iron Works directly about their proposals, the e.mail address is WoodgrangeRoad@yourshout.org. Their freefone number is 0800 458 6976. Jan - March 2019 - completion of project: new owners/tenants move in. 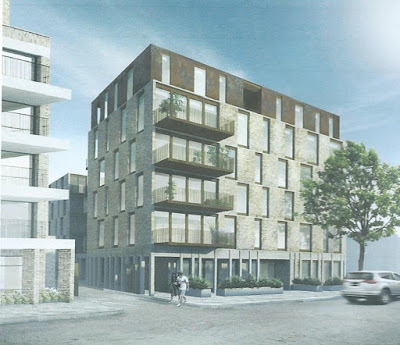 Concerns about parking, but I and other members expressed a number of other concerns based on the design we saw that night, including the design of the building, the density, the lack of family accommodation and the lack of affordable housing on the site. I am not opposed to new developments, I'm not opposed to sympathetic modern design on a Victorian high street and I think this space on Woodgrange Road is a prime site for something that offers some retail and some residential, but I was glad that this iteration of the application was deferred and hope that the developer will go away and do some more work before it comes back. Based on this, it would seem that the scheme will be at least three months behind the projected time-table outlined above, even if it is eventually approved in some form. The planning application was approved, in an amended form by the Council on 16 May. The Committee document seems to be unavailable for access on the council website at present. The proposal offered some new "mock-ups", pictured bellow. These are only illustrative, however, as the developer must seek final approval from the council's planners for the materials and colours of the facades they chose to use. The green higher floors in the mock-ups below, for example, could be rejected for different colours and/or materials further down the building process. There will be 75 flats in the development, with only 3 parking bays and 112 bike rack spaces. The parking bays will not be allocated to individual tenants. There will be no "affordable housing" in the development. Instead the developer will sell them all at market value. At Newham Council's request, instead of building any "affordable housing" in the development, the builders would pay the council £1.5m, which it will use to construct "affordable housing" elsewhere (presumably in Newham). Although not directly a feature of the development, local shoppers may be pleased to hear that Barry's, the butchers, have found alternative premises nearby. Eighteen months on from the original public consultation, referred to above, it looks as though demolition work is about to start on the site. Construction staff began the process of erecting barriers between the properties and the public highway on 8 October 2018. The work is about nine months behind the schedule envisaged by the original developers. The delay can be explained by the fact that there has been a change in developers during that period and the last tenants of the existing buildings did not vacate the premises until May this year. The new developer/builders are Gateway Housing Association, who also own the cleared and vacant block behind this Woodgrange Road one. 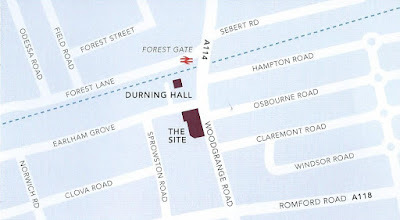 See here, for details of that Earlham Grove development. The fact that one organisation owns both sites should simplify construction, minimise local inconvenience, avoid squabbles between developers and make life easier of local people during the 15-18 month construction period. Gateway Housing Association began life as the Bethnal Green Housing Association in 1926 - and still manage their first block! They grew steadily over the next seventy years, and merged with other east London Housing Associations in the process. They changed their name to Gateway Housing Association in 2008. See here for their website. Their stock is still predominantly in Tower Hamlets, but they have expanded more into Hackney and Newham over recent years. They currently manage 3,000 homes, the majority for social rent. They plan to build 500 homes over the next three years. The 80 flats proposed for the Earlham Grove development and the 75 in this development will constitute about a third of their building plans over the next three years - and so be a substantial invetsment for the Housing Association, who have a very real vested interest in ensuring that their future housing stock is built to a high standard. Woodgrange Road will be transformed over the next 18 - 24 months, with the promised comletion of Crossrail within a year, these two developments at or near completion and the anticpated go-ahead for 33 flats at the Methodist church, opposite (see here). No sooner had demolition work began on 139a - 149a Woodgrange Road than a new set of planning proposals hit the desks of the Planning Department. They were for a relatively small development in Earlham Grove, between the significant Gateway development (see above), covering nos 140 - 150 and the Community Garden, at 136. Full details can be found from the council's planning site, here. behind the other on the site of 138 Earlham Grove. The proposals for 138 Earlham Grove were submitted by Savills, a long-time property agent and developer. They would like to build two six-storey blocks on what is currently a brownfield site, providing a total of 36 apartments. They are honest enough to admit that the proposal does not fit the Council's desired criteria, in terms of social mix and sizes of flats, They are at pains to point out, however, that their plan to construct 21 one-bed flats (58% of the total), four two-bed flats (11% of the total) and eleven three-bed flats (31% of the total) comes closer to meeting the council's desired mix than the Woodgrange Road development, for which demolition work has just started. How long before their is a serious planning proposal to redevelop Durning Hall and adjacent buildings, that was central to the much derided Obsidian proposals of five years ago? 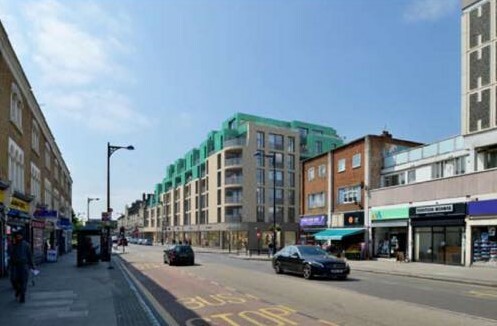 Such a scheme would dwarf, in scale, existing three, the 200-odd flat, developments already on the drawing board for Woodgrange Road/Earlham Grove. Will the Council bend its knee to plans that seek to build higher than the rapidly developing norm of six-storey blocks in the area, for any new proposal, under the guise that the block/s will be a focal/landmark development for Forest Gate - coming, as it/they would next to the station and perceived heart of the area? How much longer can the Community Gardens survive on their current site? Developers are moving in closer, and the land - council-owned - is on lease to the Garden for less than a year now, under the terms of the original agreement. Watch this space for a public row! At the end of this article is a Comments box. Would-be contributors are invited to post their thoughts and share them with other local people. (This site gets over 250 hits per day, so people may feel it is a good vehicle to act as a discussion forum). If you wish to contribute, simply fill in the comments box, below. You have the option of leaving your name and or a pseudonym, or posting anonymously. Your posting e.mail address will be known by the site. We undertake to share it with nobody, if that is your choice. At the foot of the comment box there is a check box, by ticking this, you will receive an automatic e.mail every time somebody responds to the thread of comments, and you will, of course be free to reply to those, as you wish. We guarantee that there will be no editorial interference with responses on this forum (which was not the case on other local forums at the time of the Obsidian proposals), expect for posts which are: abusive, potentially libellous, or discriminatory on grounds of ethnicity, gender, age, ability, religion etc. Posts that are totally irrelevant to the subject will be deleted and posts that are excessively verbose will be summarised and then only published with the explicit approval of the original contributor. The forum will be open to those supporting and opposing the proposals . The developers, are invited to contribute and answer questions etc, should they wish; although we are anxious that this does not simply become a PR medium for them. If this suggestion works as an effective discussion forum: fantastic. We may adopt the approach for other topics of local controversy on this site, in the future. If it doesn't work, fine! Our last post featured some heroic local women's fight for the vote, this one looks at a rather less public spirited local woman. • Trial at the Old Bailey, before a leading judge who has previously supervised a number of other "witchcraft trials"
• Received massive coverage in the local press (over 8 densely packed full broadsheet page columns of the Stratford Express) at a time of newsprint scarcity and rationing. • Unusually for a relatively minor case, still merits its own substantial file in the national Public Records Office, including a full transcript of the West Ham Police Court proceedings. • Caused panic within the more formal Spiritualist movement within the UK. • Saw Yorke represented in court by William Daybell, whose firm of solicitors continues to practice in the Broadway in Stratford today. The above is all the more surprising when a study of the court transcripts suggests that the case was little more than that of a rather clumsy, small-time, local con artist, who prayed, overwhelmingly, on the fears and gullibility of poor, vulnerable, East End women. Conspiring together with persons unknown to pretend to exercise, or use, a kind of conjuration (magic spell) and that through the agency of Mrs Yorke, spirits of deceased persons appeared, and that the spirits were communicating with living persons present. The charges related to seven events occurring over three dates in May 1944, West Ham magistrates heard on 11th July. On the July date she was remanded on bail until the end of the month, when a full three day trial took place at the local Police (former name of Magistrates) Court. These appearances resulted in extensive coverage in the Stratford Express of the time (see extracts from clippings, below). basement was the "scene of crime"
On the advice of the Director of Public Prosecutions, Jane Yorke was then remanded for trial at the Central Criminal Court (Old Bailey) in September later that year. 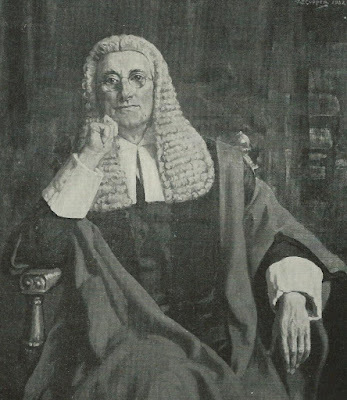 At this trial she was found guilty on seven counts by the Recorder of the Court, Sir Gerald Dodson, and was fined £5 and bound over, to keep the peace and not re-offend, for three years. The relative leniency of the punishment has subsequently been put down to her age, disability and previously reported good behaviour. All in all, this was an anti-climatic outcome for a case that attracted so much attention and had such significant long term effects. Judge Dodson told Yorke, at the conclusion of the Old Bailey trial, that she "had been trading on the susceptibilities of poor distressed people" and that it was necessary "to protect women who had gone( to her) in their sorrow and bereavement to get some spurious comfort". The case was the last conviction in England under the Witchcraft Act of 1735, and, because of its nature, lead to a repeal of that Act, and replacement by the Fraudulent Mediums Act, 1951. 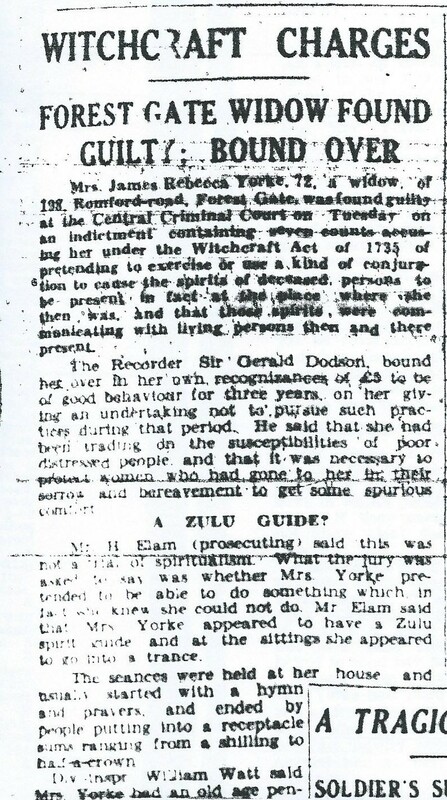 Nobody ever claimed Yorke had been a witch, but the Witchcraft Act was, apparently, the only legal device available, at the time, for arresting and charging her for being a phoney medium. The replacement 1951 Act effectively recognised that, and updated the legislation to be more specific about fraudulent mediums. Mr Elam, the prosecutor at the Old Bailey, said that the Yorke case was not a trial of Spiritualism, but that she was pretending to be able to do something, which in fact, she knew she could not do. 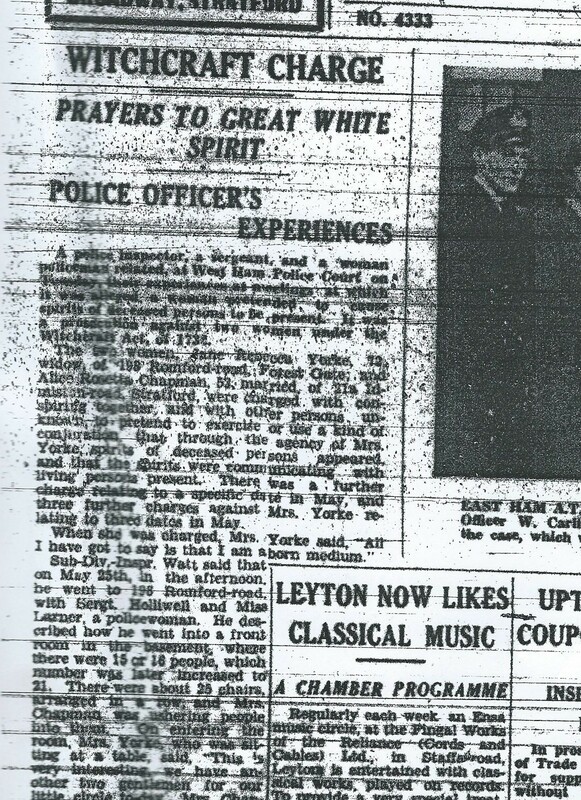 Following Yorke's conviction, some Spiritualist meetings due to be held elsewhere in the country, were banned, with her verdict being used as justification. This caused some consternation within the Spiritualist community, who sought legislative clarification of their status - hence the 1951 Act. The Yorke case is covered in Malcolm Gaskill's book: Hellish Nell, Last of Britain's Witches and Gerald Dodson's memoirs: Consider Your Verdict, as well as in the Stratford Express of the time. This article is based on these sources, together with her extensive file at the Public Records Office. 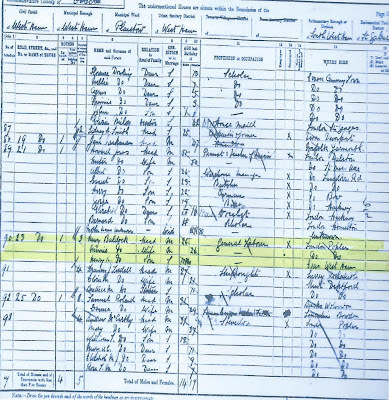 Jane Yorke was arrested on 10 July 1944 at her Romford Road home. "Why after 23 years? ... All I have got to say is that I am a born medium", she told the police. The case against her was that she held séances in the front room of her basement where "spirits" spoke through her Zulu guide. He apparently, impressed the sitters with his "war cry" of "Umba, Umba, Umba"! Three police officers - Sub Divisional Inspector William Watt, Sergeant William Holliwell and Women Police Constable Constance Larner - had attended these events and described them in court. Their testimonies suggested that each of the events was attended by around 20 - 25 people (almost all of whom were women), each of whom was required to pay 1/- (5p) and place a personal item on a hymn book. Yorke then appeared to affect a trance and spoke through "communicants" who passed on messages from alleged deceased people to some of the attendees. She claimed that Queen Victoria was a frequent communicant, as was Sherlock Holmes author, Sir Arthur Conan Doyle (who, himself had been a slightly eccentric Spiritualist). Apparently, Mrs Yorke "scrunched up her face" when she was "conveying messages from Queen Victoria". One "message" from the late queen, is said to have guaranteed the success of D-Day : "Get your red, whites and blues ready". Conan Doyle, allegedly, told one sitter that the War would be over by October 1944. Acting under cover, the police inspector was told that he had lost his father in the First World War, the policewoman that her dead baby was beside her holding a bunch of roses and the sergeant that his brother had been burned alive during a bombing mission in World War 11. The police officers testified that none of these "facts" relating to alleged relatives was true. The court also heard of messages from alleged dead relatives of other attendees, who according to those present, had not existed. All of these claims were, presumably, reasonably easy to prove, or disprove. When they were shown to be inaccurate, Yorke blamed the effects of World War 11 bombings on her lines of communication. Some of her messages, however, came relatively close to terrifying her audience. In one case she impersonated the brother of one of her sitters. He had been killed in a World War ll flying mission (this part was almost accurate) and told the woman that "a loved one is going to meet a serious accident but I fear it will be fatal." The sitter was not told who this person was to be, but was advised to "take care of her husband". She, understandably perhaps, responded by "crying bitterly." 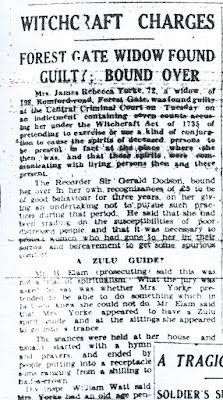 The prosecutor at the trial said that Mrs Yorke appeared to have a Zulu spirit guide and that at the sittings she appeared to go into a trance. For the prosecution, Divisional Inspector William Watt said that Mrs Yorke had an old age pension of 10/- (50p) per week. She had been interested in Spiritualism for 30 years and had been actively engaged in it for the previous ten. It was quite clear that the majority of the women (attending) were either widows or mothers of men lost in the war, and from my own observations, it was obvious that a number had been on more than one occasion and that Mrs Yorke relied very largely on an extremely keen memory in dealing with them. Given the inaccuracy of much of what she told the under-cover police officers at the seances, it would have been surprising if she was not as inaccurate in her "messages" from other alleged spirits to other attendees. If so, it begs the question of why those attending returned to hear Yorke so frequently, unless they were both vulnerable and desperate. Mrs Yorke, from the dock, said that she did not charge for private sittings or circles (clearly not true, according to the accepted police evidence), but that there was a bowl in which people could drop money if they cared. She said that she did not know what she uttered during séances. Gerald Dodson, the Recorder, in sentencing Yorke, said that he wanted an undertaking from her that the harmful practice would be dropped and that he had no desire to deal with the case in any other way. The Home Office took the records of this and earlier cases and drafted a law that excluded mention of witchcraft, which didn't feature in her case, and instead focused on the practice of fraudulent Spiritualist Mediums - hence the 1951 Act. 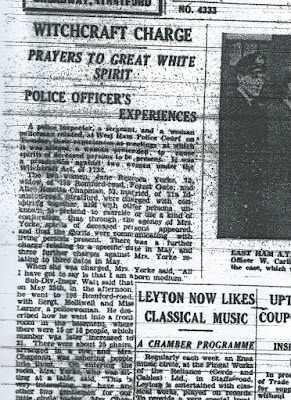 This satisfied "legitimate" Spritualists, as the Yorke case and outcome had subsequently been used by the police in a number of localities elsewhere in the UK to prevent advertised Spiritualist meetings from happening. Unfortunately, little else is known of Jane Yorke. No publicly available pictures of her seem to have survived and there are no verifiable details of her death, although she may have been buried in Hackney in the early months of 1953. It is not clear whether anyone has heard from her since. Last year, to commemorate International Women's Day, we featured the story of Minnie Baldock, the organiser of Forest Gate's Women's Social and Political Union (WSPU) - popularly known as The Suffragettes - between 1906 and 1911 (see here). 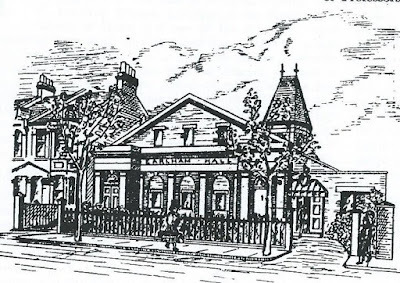 This year we focus on a number of local addresses of significance to the WSPU, in Forest Gate, neighbouring Canning Town and the adjacent district of Bow - all within four miles of Forest Gate. We are deeply indebted to Vicky Stewart and Spitalfields Life for the research behind the identification of the Bow addresses and for sourcing some of the photos (see footnote). Location of a WSPU meeting in October 1908. 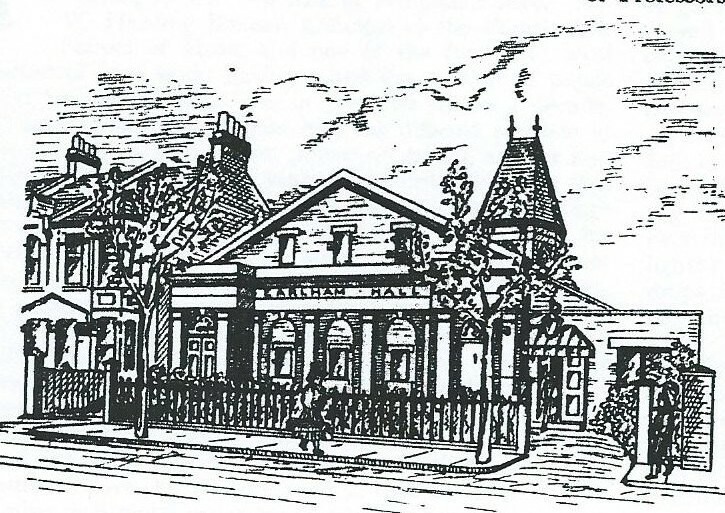 The illustrations below show a near contemporary drawing of the exterior of this, then important, public building and a Stratford Express report of that meeting. 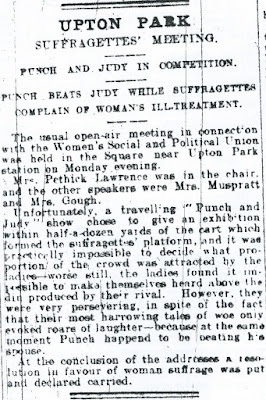 This was the location of a meeting of the WSPU in Forest Gate, in January 1908 (see Stratford Express cutting). 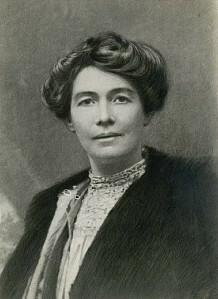 The speaker was the national treasurer of the Suffragettes, Emily Pethwick-Lawrence. 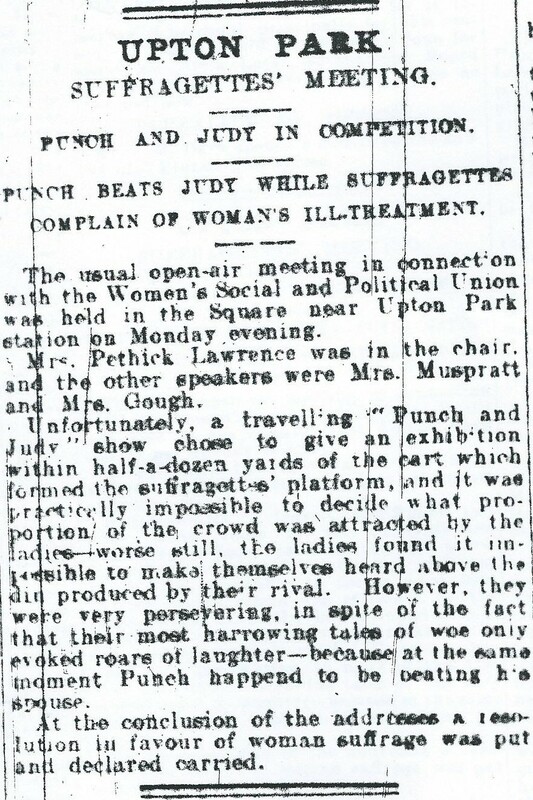 An outdoor Suffragette meeting, addressed by Emily Pethwick-Lawrence (see above) was interrupted, and probably sabotaged by, a travelling Punch and Judy show, featuring a Mr Punch beating a Judy in September 1906 (see press cutting). 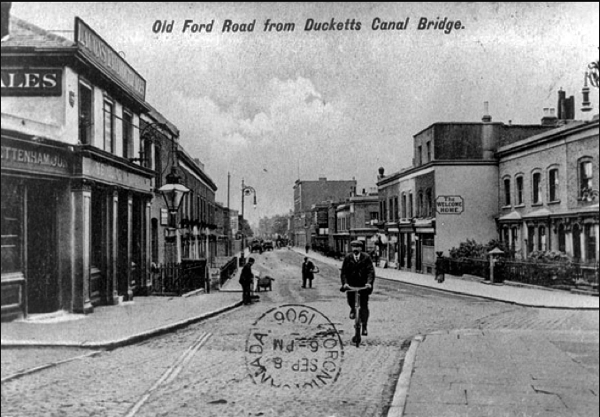 Minnie Baldock , Forest Gate Suffragette organiser and subject of our profile last year, was an activist in this area, particularly from 1905 - 1911. 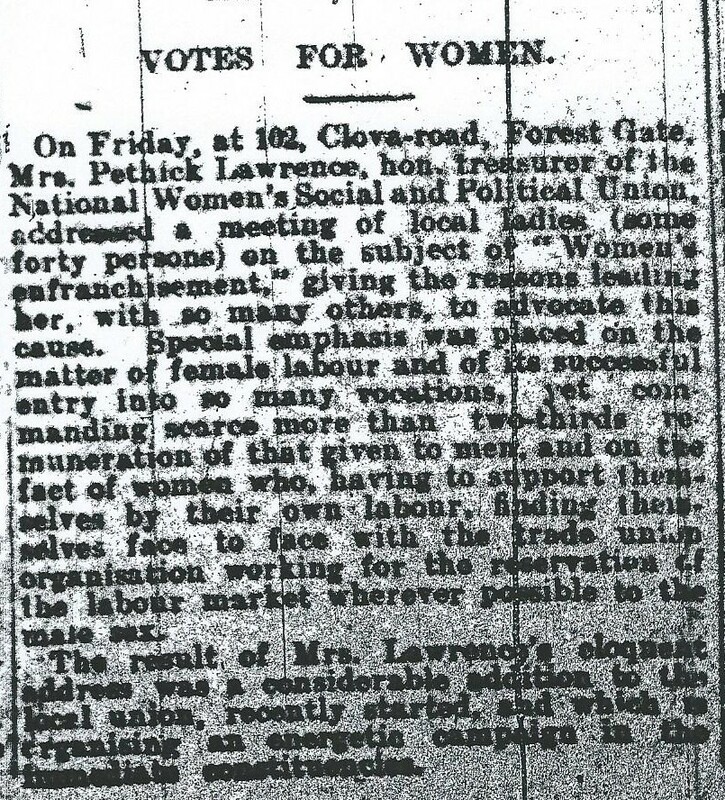 Before becoming the Forest Gate organiser, she had been instrumental in establishing the Canning Town branch of the WSPU, at a meeting on 29 January 1906. Unlike many high profile Suffragettes, she was a working class woman, very much in tune with her local community. 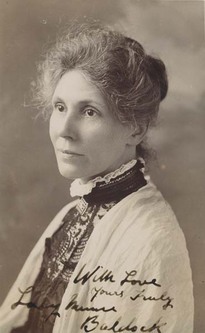 She was arrested and imprisoned for a month, for demonstrating outside Parliament, in 1908. 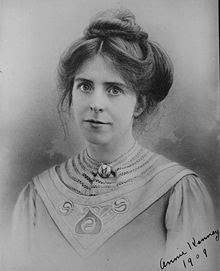 Minnie gave a room in her house in Eclipse St, Canning Town (subsequently demolished) to fellow working class activist and prominent Suffragette , Annie Kenney, when she travelled from Lancashire to fight the cause in London. The pair campaigned together in the East End and more widely elsewhere in England, offering some working class authenticity to the Suffragette cause in many communities, which were sometimes difficult to penetrate by the very middle class Pankhursts and some of their sisters. Currently a green space, but in 1891 home of Minnie Baldock and her trade union and socialist councillor activist husband, Henry Baldock. 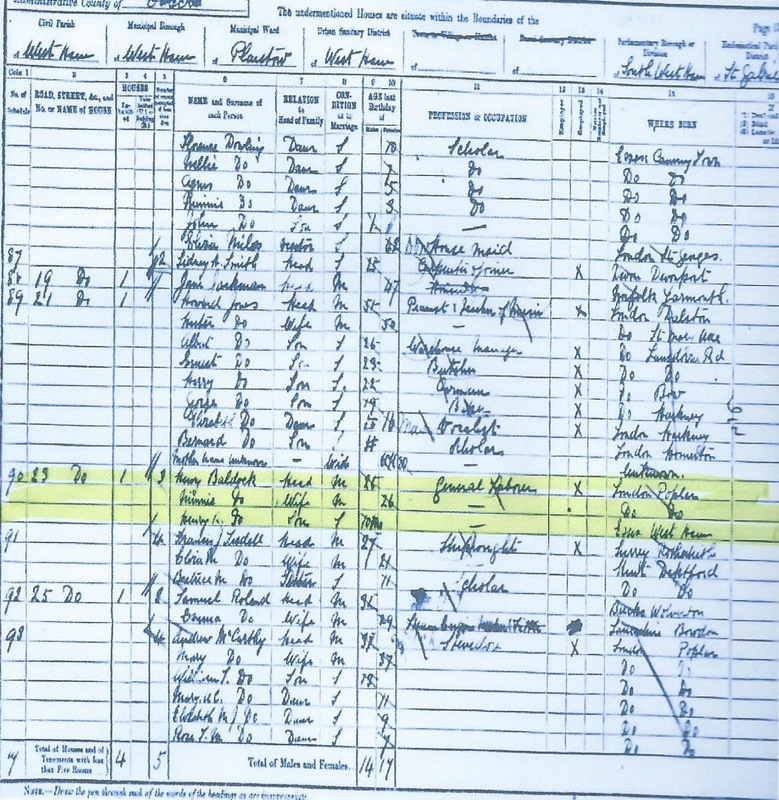 See census extract, verifying the residence. 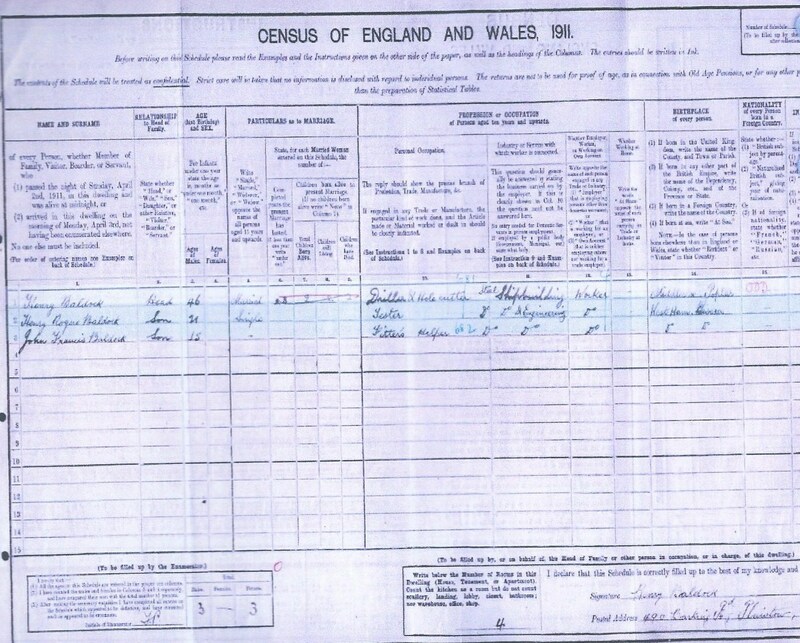 Home of Minnie Baldock at the time of the 1911 census in April. Minnie was diagnosed with cancer four months after this census and treated at the Elizabeth Garrett Anderson hospital, near Euston. On recovery, she effectively retired from political activism and retired to Poole, in Dorset, where she was to live for more than 40 further years. 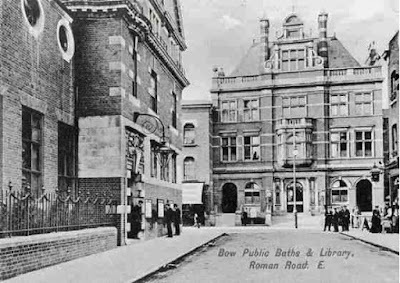 Bow, as part of the then borough of Poplar, was a hotbed of left wing politics in the first quarter of the twentieth century. It was an area dominated by casual employment - mainly dockers (men) and seasonal factory work (women). As such, the area was desperately poor. It had already played an important part in the birth and growth of the Dockers' Union, which was to form the basis of what later became the Transport and General Workers' Union T&GWU). Casual work meant frequent periods of unemployment and reliance on Poor Law payments for men, women and families. The structure of this early form of public assistance required that the entire cost of the benefits distributed in any one Poor Law district to be met by the other, local people, within the same district. So, people living in the poorest parts of the country paid much higher council rates than those in wealthier areas, because of the larger number of destitute neighbours they were required to support. This ludicrous position was challenged by Poplar's Labour Council in the 1920's, led by George Lansbury, via a civil disobedience campaign. 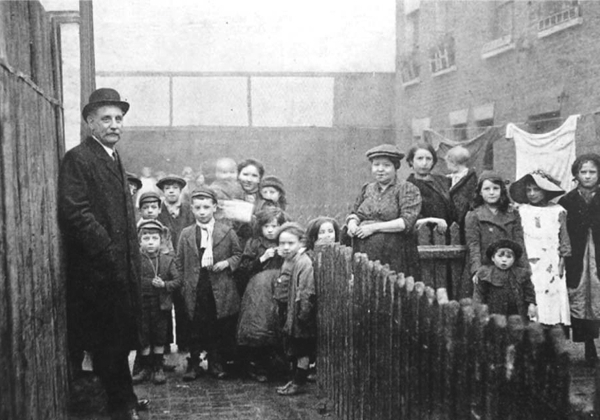 The councillors' actions in defending the living conditions of their fellow citizens, resulted in their imprisonment - but was ultimately instrumental in ensuring that there was a nation-wide levelling out of support for the poorest areas. Lansbury, a decade or so later, briefly became leader of the Labour Party, nationally. 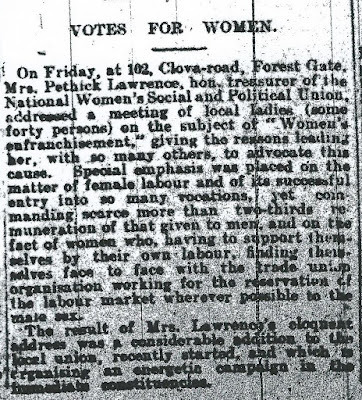 Prior to this, however, Lansbury had been very much influenced by the Suffragette movement, which inspired him to resign as the MP for Poplar in 1912. He did so in order to provoke a by-election in which he stood, and focused it exclusively on the issue of Votes for Women. 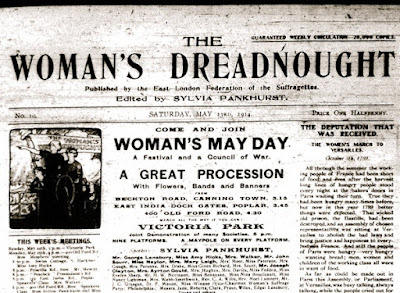 leader) in Bow: His 1912 "Votes for Women"
Unfortunately, he was defeated in the election, but it proved to be the springboard for longer-lasting and more significant local and national developments, some of which have been alluded to, above. Sylvia Pankhurst, one of the formidable family of Suffragettes, came to Bow to assist with the by-election campaign and stayed afterwards to organise within the area. She opened up the first local WSPU headquarters on Bow Road in 1912 (soon after Forest Gate's Minnie Baldock had effectively stepped down in the West Ham area, due to ill-health). Unlike the rest of her family, Sylvia was deeply committed to actively organising local working class women, not simply around the issue of votes for women, but on a wider range of social issues related to their social and economic conditions and poverty. As such, she became politically divorced from the rest of her family. 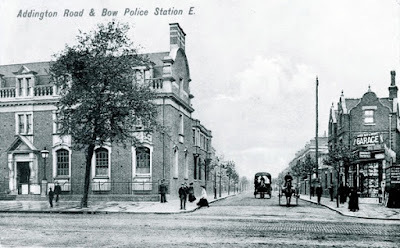 In recognition of this, the Bow/Poplar organisation changed its name in 1914 to the East London Federation of Suffragettes (ELFS). Their activities were inspirational and paved the way for the post World War 1 civil disobedience undertaken by the Poplar councillors, referred to above. The remainder of this blog centres around three almost parallel roads, running West to East into Newham from Poplar. By coincidence, the WSPU's headquarters was, over a relatively short period of time, located successively on each of them. The roads were: Old Ford Road, Roman Road and Bow Road. Buildings on them played a significant role in the history of Votes for Women. Below we provide details of some of the more significant locations and photographs of most of those which survive, today. Number 198 - First headquarters of WSPU in Bow in 1912. It was an empty baker's shop on which Sylvia Pankhurst painted "Votes For Women" in gold paint, and addressed crowds from its doorstep. On February 14th 1913 we held a meeting at the Bromley Public Hall, Bow Road, and from it lead a demonstration round the district. To make sure of imprisonment, I broke a window in the police station ... and went to prison and began the hunger and thirst strike. While I was in prison after my arrest at Shoreditch ... a meeting ... was held in Bow Palace on Sunday afternoon December 14th. After the meeting it was arranged to go in procession around the district and to hoot outside the homes of hostile borough councillors. Suddenly, without a word of warning, we are pounced on by detectives and bludgeoned and women were called names by cowardly detectives. When nobody is about ... these men are not fit to help rule the country, while we have no say in it. 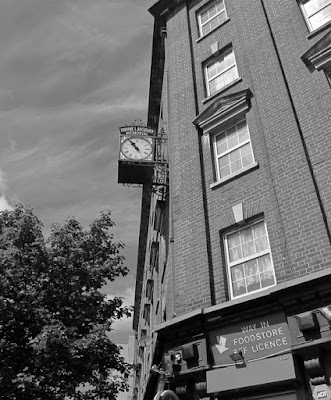 Minnie Lansbury clock - near junction with Alfred Street - Minnie was George's daughter-in-law who was active in local politics. She was imprisoned in Holloway for her Suffragette activities and died age 32. 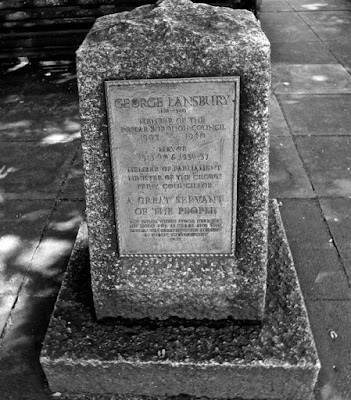 George Lansbury Memorial - near junction with Harley Grove - Memorial commemorating Suffragette supporter, who lived locally and worked at his father-in-law's timber merchants, nearby. 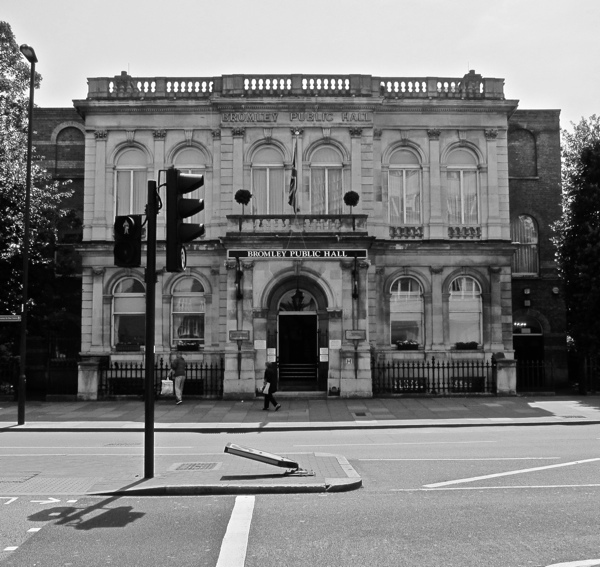 400 - Third headquarters of local Suffragettes (initially WSPU, later ELFS), in 1914. A women's hall was built on land at the rear, which was used as a cost-price restaurant, providing nutritious meals to women suffering huge increases in food prices in the early months of World War 1. 438, The Mothers' Arms - The East London Federation of Suffragettes set up a creche and baby clinic here, staffed by Montessori-trained nurses. It was converted from a pub previous called the Gunmakers' Arms. 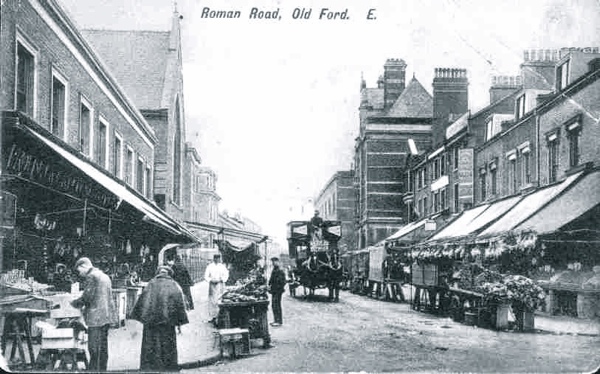 Roman Road Market - The East London Federation of Suffragettes ran a stall in the market, decorated with posters, selling their newspaper The Woman's Dreadnought. 159 (subsequently renumbered 459) - Location of WF Arber and Co, a firm of printers that produced free-of-charge handbills for the WSPU. 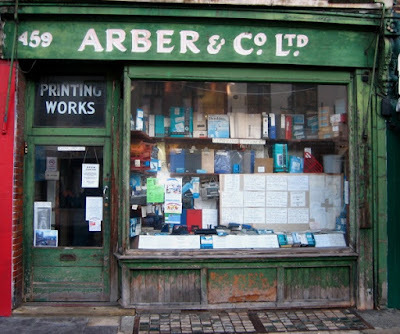 We decided to take a shop and house at 321 Roman Road at a weekly rent of 14s 6d (73p) a week. It was the only shop to let in the road. The shop window was broken across and only held together by putty. The landlord would not put in new glass, nor would he repair the many holes in the shop and passage flooring because he thought we would only stay a short time. We would be delighted to hear, and include details of any other local sites of significance, which we will be happy to add to the above account. Footnote: Fuller details of the Bow addresses and Spitalfields Life can be found here. An excellent, accessible, publication: East London Suffragettes by Sarah Jackson and Rosemary Taylor provides further details and gives a great account of the suffragette movement in, well, East London. Priced £9.99, it can be purchased at the Newham Bookshop, and other outlets.